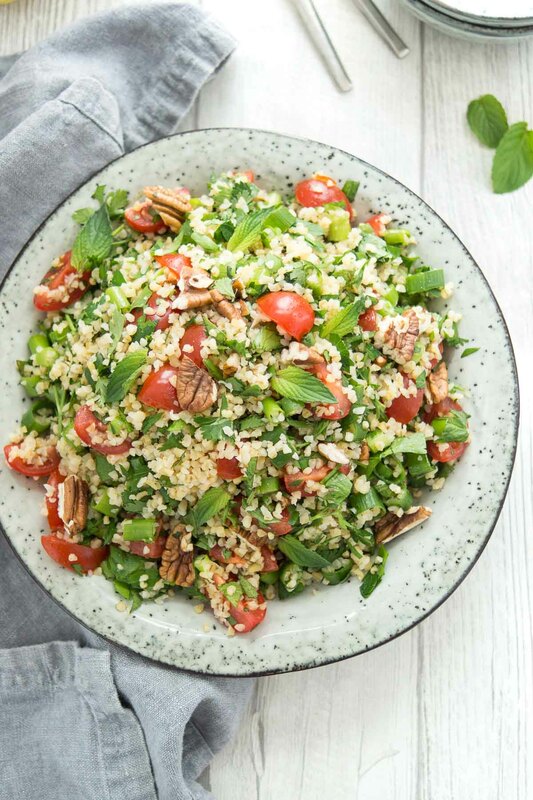 Here’s a beautiful, insanely delicious and very do-able recipe using featuring bulgur, fresh summer herbs, sweet cherry tomatoes, green onions and toasted pecans. Inspired by Middle Eastern flavors of tabbouleh, this simple summer salad recipe is packed with fresh flavors. Cilantro takes center stage along with parsley and a pretty intoxicating amount of fresh mint. Plus a whole lot of fresh squeezed lemon juice to keep this salad brightly flavored. 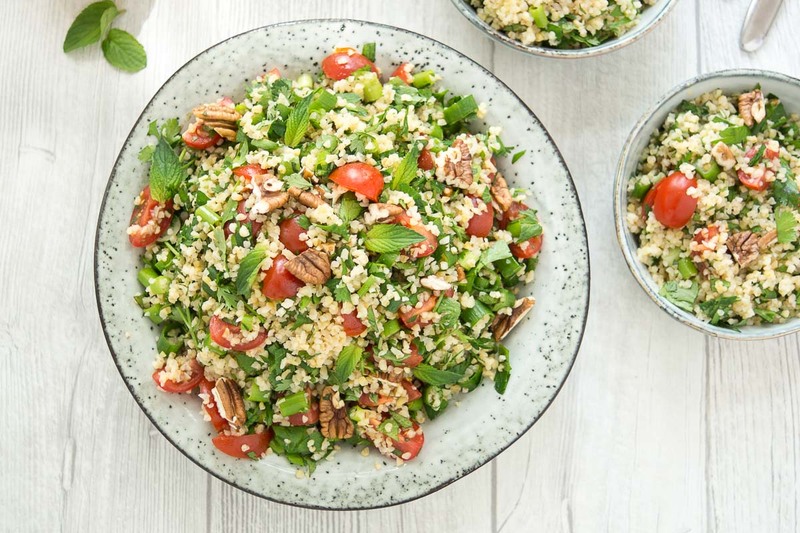 This recipe is inspired by kisir, a Turkish bulgur wheat salad which can be thought of as a sassed up version of tabbouleh, and in this case, my bulgur salad is a little different from both of them. Kisir contains a mix of tomato paste and in some versions red pepper paste — and in Turkey it varies from region to region. Classic Middle Eastern tabbouleh on the other hand is all about parsley… I’d say it’s essentially a parsley salad. That is if you are sticking to a classic version. Of course, I have my own take on it. Whether with roasted carrots, a herb-loaded chickpea tabbouleh salad or broccoli as a replacement for bulgur, I am a true fan! 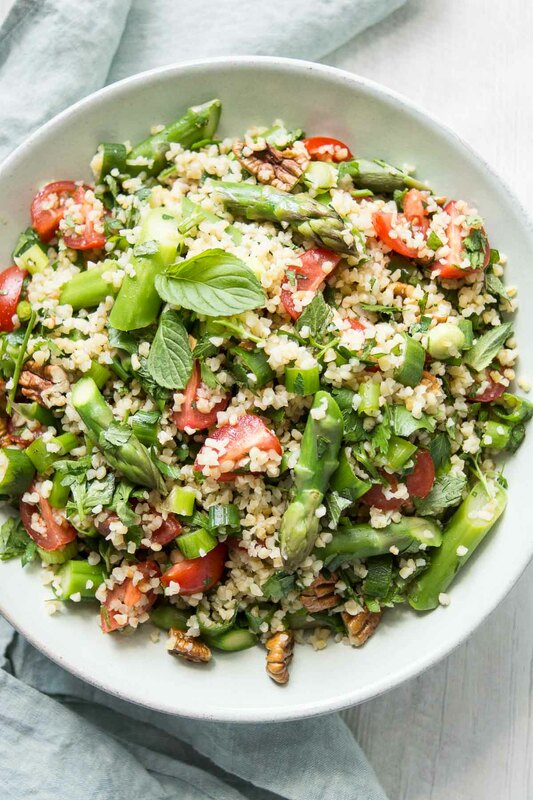 Where ever the inspiration comes from, this salad is truly about the bulgur and of course a generous amount of herbs and other ingredients that turn this salad into a bold celebration of texture, flavor and colour. Because bulgur (sometimes referred to as cracked wheat) has been partially pre-cooked and dried, it needs to be boiled for only about 10 minutes to be ready to eat. Think about it, that as much time as cooking pasta! And as a whole wheat grain it is way more nutritious. Bulgur is packed with a wealth of fiber, protein, and B vitamins and makes a fabulously nourishing and quick addition to any meal. But the best part about bulgur is its rich, nutty flavor. This salad can also be made with couscous or quinoa instead of bulgur. It makes a great side dish for grilled poultry or fish, even vegetables, as well as being perfect for prepared lunch to-go or picnic salad. Or in my case, I brought this along as my “in flight, hotel snack dinner” when we flew to Nuremburg for the Rock im Park music festival. And the question everyone asks is “did you tent it?”. No! Yes, even as a Canadian I did not camp. Or “glamp” for that matter. Hotel One, we love you. And by the way, if you ever get a chance to see Muse live… UNBELIEVABLE! Oh and by the way… it is asparagus season so feel free to add some blanched asparagus to your salad. Yes, I can’t get enough, I have been throwing it in everything lately! 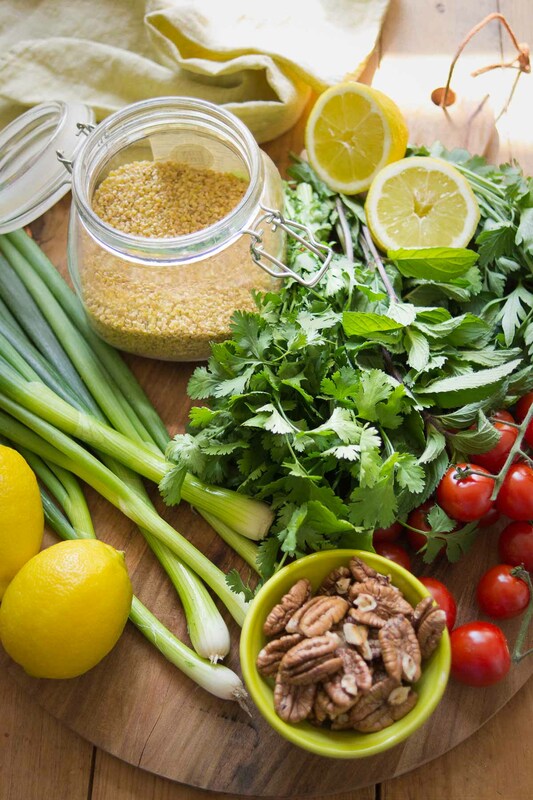 A super simple, quick and healthy bulgur salad recipe. Fresh and bright-flavored it is a great salad to pair with just about anything or to enjoy on it's own. Serves 4-6. To cook the bulgur, combine 1 1⁄2 cups medium-grain bulgur and 3 cups water in a medium saucepan. Bring to a boil. Cover, reduce heat, and simmer for 10 to 12 minutes or until tender. Drain, if necessary. Set aside to cool until lukewarm. Fluff the bulgur, set aside and cool to room temperature, then make the salad. Once the bulgur has cooled, stir in the green onions, tomatoes, pecans, parsley, mint and cilantro. Mix together the lemon juice and olive oil and drizzle over the salad. Toss to combine and serve immediately. Enjoy! Alternatively, bulgur can be soaked. To soak, put the bulgur in a bowl and pour over boiling water until the water level is about 1 cm above the bulgur. Cover with plastic wrap and let stand until water is absorbed, about 30 minutes. I use equal amounts of herbs for this bulgur salad. 1 small bunch is about 5 tablespoons chopped herbs. The fresh mint is a dominant flavor in this salad. If you prefer a more subtle mint flavor then use only 2 tablespoons. For a gluten-free version of this salad recipe, use quinoa or millet in place of bulgur. If you make this Bulgur Salad with Fresh Herbs and Lemon recipe, I’d love to hear how it turned out for you! Be sure to rate it and leave a comment below to let me know! Especially if you have tips for other readers. Or take a picture and tag me on Instagram @ellerepublic and don’t foget to hashtag #ellerepublic so I don’t miss it!